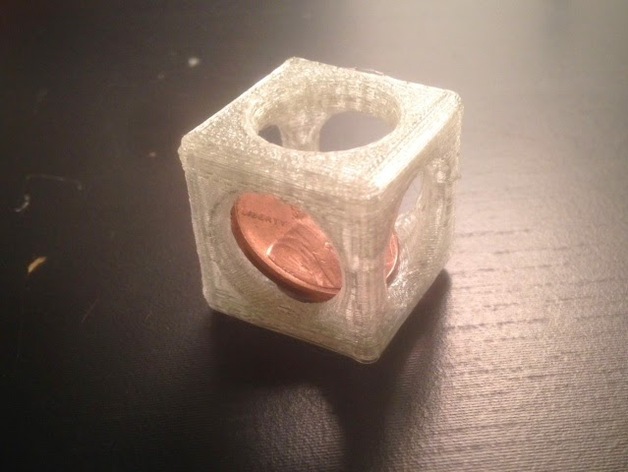 Our first-day 3D print will be a Penny Trap. This model is a good illustration of a design that is possible with 3D-printing but would be impossible with standard subtractive manufacturing methods such as milling. How does the penny get inside? We have three different types of 3D printers in JMU 3SPACE, and each one operates a little differently. The Afinias are operated from the computer with the “3D” software. 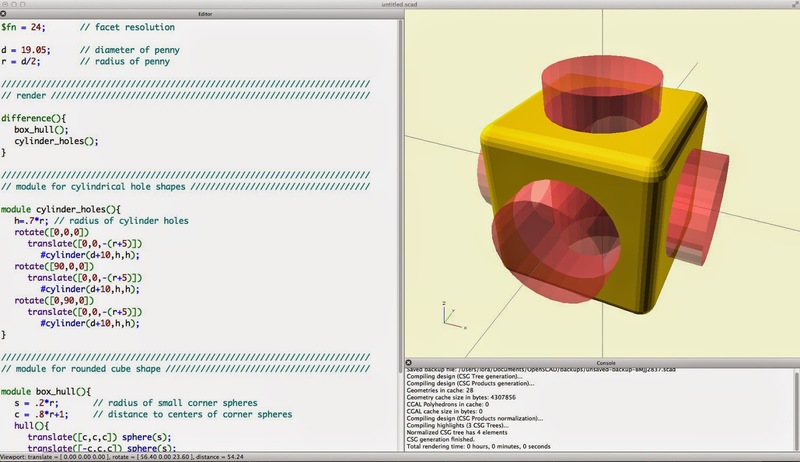 This software opens STL files, slices them, and sends them directly to the printer. The Ultimaker printers are operated from their own screen an jog wheel, with files on an SD or USB card that were previously sliced the the software “Cura”. We’ll learn more about this later on; right now we just want to print something! The “3D” software should already be open on your computer, with model already be loaded and proper settings already in place. From the “3D” software, choose the 3D Print drop-down menu from the very top of the screen (*not* the button icon labeled 3D print), and select Table Heat 15 mins. Now press the 3D Print button, which inexplicably looks like a 2D paper printer, then press “OK”. The model should already be sliced and ready on an SD card or USB drive inserted into the front of the printer. Move the jog wheel on the front of the machine to select Print, and press the jog wheel like a button. Use the jog wheel to select the file UM2E_pennytrap or UM3_pennytrap, depending on the model of your machine, and press the button when that file is highlighted. From the Afinia “3D” software on the computer, choose the 3D Print drop-down menu from the very top of the screen (*not* the button icon labeled 3D print), and select Maintenance. From the Maintenance pop-up window, click Pause. Close the Maintenance window immediately by pressing Quit (trust me). Insert the penny, being careful not to accidentally touch the hot end of the printing nozzle. When you’re ready to continue, open the Maintenance window again and click Resume. Move the jog wheel on the front of the machine so that Pause is highlighted, then press the jog wheel like a button. When you’re ready to continue, move the jog wheel to Resume and press the button. But how did this Penny Trap get MADE? In this class we’ll sometimes print other peoples’ models for practice, or start with other peoples’ designs for inspiration, but most of the time we’ll be creating the 3D models ourselves from scratch. So how do you do that?? The Penny Trap is a very simple model, and you could make it in lots of different design programs. We’ll talk more about this in the coming weeks, but as a preview, here are two walkthroughs of how the Penny Trap could be created. Second, with OpenSCAD, you can use simple code to place, rotate, and take “differences” of objects to make the Penny Trap design. 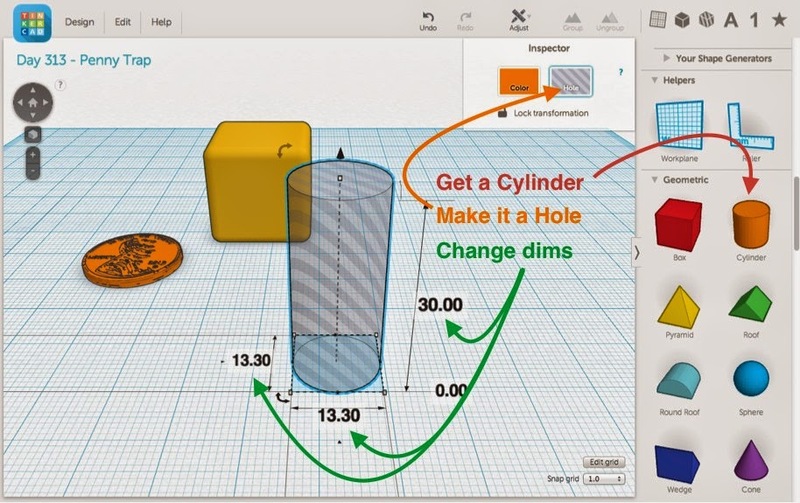 You can read about this at the MakerHome tutorial Designing a Penny Trap with OpenSCAD, and take a look at the actual OpenSCAD code. One of the great things about designing models in OpenSCAD is that they are parametric, which means that you can change features of the model very easily by modifying the values of its input variables. In the case of the Penny Trap, this means that we could write code that creates “traps” for any type or size of coin. 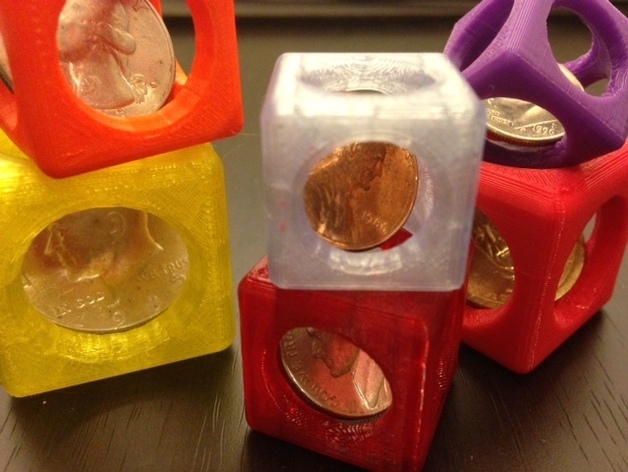 Here is that very thing: the model Customizable Coin Traps on Thingiverse. Using the Customizer interface you can choose traps for coins from all around the world, or select your own unique coin size.